A key benefit of the new iPhone/iPod software release is the OS’s ability to handle the CalDAV protocol natively. Translated into something approaching normal English, this means that you can view and create entries in your Google calendars using the iPhone calendar app. (In the past you could view them if they were synced from your Mac, but not update them on the hoof). 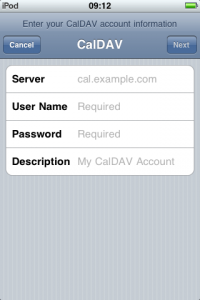 I’ve written before about why this is important and how to use CalDAV on your Mac. How do you do it on the iPhone? You can just enter ‘www.google.com’ as the server, and your Google username and password. You should get a little message at the top of the screen saying that your account is verified, and that’s it. Your Google calendar should now be one of the ones available in the Calendar app! OK, that was the easy bit, and for most people, the only bit. But Status-Q readers are not ‘most people’. Oh no. So, suppose you have a shared calendar? A company or family one, perhaps? and you need to get that into the settings on your iPhone. But how do you find this URL? If you’re already using CalDAV in iCal on a Mac, it’s pretty straightforward – you can go to iCal Preferences > Accounts and look under the Server Settings tab for the Account URL. If not, then go to Google calendars on the web, and find the calendar settings for the calendar you want. (You can get to the settings from the ‘My calendars’ box on the left – see the little pull-down menu beside the calendar’s name.) Near the bottom of the Calendar Details page in the Calendar Address section, you’ll see the calendar ID listed. after it to get the URL you need. OK, so you’ve got a long URL that you really don’t want to have to type into your iPhone. But you’ve now got cut and paste on the phone. So you can email it to yourself, and copy it. Now go and add another CalDAV account on the phone as before. This time, when entering the Server address, paste this long URL. You won’t see it – the screen reverts to www.google.com, but it will have taken it in, and you can enter your login details as normal. Later you can check the URL by going back to the account and clicking the Advanced Settings page, but this shortcut worked for me.